Soroks�r is the 23th district of the capital. The image is based on the following pages: <www.mmi.hu> and <www.nuertingen.de>. Res. No. 9/2000.(III.03.) of Budapest XXIII. about the flag and CoA: The flag is horizontal. It is divided three vertical part. Black-yellow-black (1:2:1) On the center there is the CoA of the district. Here is the translation: "Description of the flag and CoA of the district: Vertical BLACK-YELLOW-BLACK [sic!] backgrounded flag. The flag's ratio is 2:1. The black-yellow parts are 1:2 ratioed. On the opposite vertical side of the flag [fly], fringed golden. 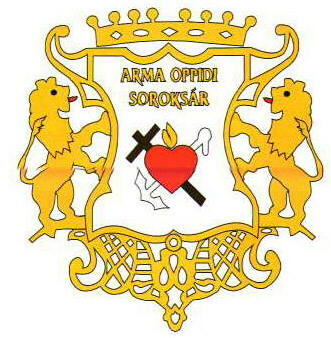 In the centre of the yellow field Soroska'r's golden-bordered CoA is placed with the inscription ARMA OPPIDI SOROKSA'R "
Image is based on Zeljko Heimer's photo. CoA from Ralf Hartemink's site.